What Does It Mean To Be Supernatural? But what does it mean to be supernatural? Being beyond scientific understanding is actually very mundane. Most of the way the brain works is beyond our current scientific understanding, but no serious researcher is throwing up his or her arms and declaring it supernatural. The relationship between mass and energy was beyond scientific understanding until Albert Einstein figured it out. The origin of mitochondria and chloroplasts were beyond scientific understanding until Lynn Margulis figured it out. Every issue of every scientific journal is filled with things that were beyond the understanding of science just a year or so prior. This is not what people mean when they say that something is supernatural. They mean the second thing — beyond the laws of nature. The word supernatural literally means “above nature,” or, more figuratively, outside or separate from nature. But what is nature and what are its laws? Consulting my dictionary once again, “nature” is defined as “the phenomena of the physical world collectively, including plants, animals, the landscape, and other features and products of the earth, as opposed to humans or human creations.” And once again, my dictionary fails to provide a completely cogent or useful definition. If humans and our creations are not natural, does that mean that the computer I’m writing on is supernatural? Again, no one would reasonably make this claim. The first part of this definition, “the phenomena of the physical world collectively,” is actually pretty good as it is. Nature, or the physical world, is made up of two things: matter and energy, which Einstein showed us are the same thing. Nature is everything that exists. It is all of the animals, plants, fungi, bacteria and all of the rest of life. It is all of the rocks and minerals and water and air. Even humans, which are animals, are part of nature. Everything beyond our planet is part of the natural world, as well. All of the undiscovered types and forms of matter and energy are part of nature. Every answer to an empirical question is part of nature, and it is the job of scientists to discover nature as it exists. Are ghosts real? This is an empirical question because the answer is not subject to ideology or personal preference. It’s not possible for ghosts to be real for me but not real for someone else, any more than the statement “the earth’s atmosphere is 78% nitrogen” can be real for me but not real for someone else. Correct answers to empirical questions are correct whether you like it or not. 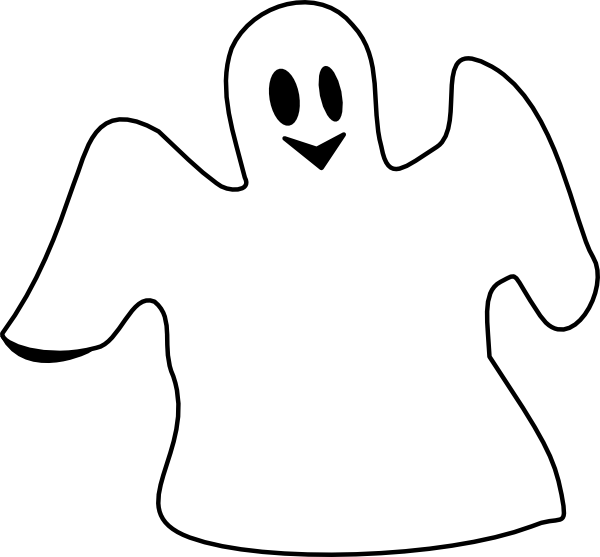 Likewise, either ghosts are real or they are not. If they are real, they are part of nature, and are therefore natural phenomenon. It may come as a surprise to people that, if ghosts are real, it will be scientists who discover them. This is true of everything else that is commonly labeled as “supernatural.” If everything that exists is part of nature, then what does that mean? If something is truly supernatural, it doesn’t exist. Have a topic you want me to cover? Let me know in the comments or on twitter @CGEppig. Follow me in Facebook. I recently spent some time at the beautiful Lincoln Park Conservatory. It is very hot and humid in the greenhouse, which may not have been the most obvious choice on a day that was already 88º outside. Nevertheless, I thought it would be a good way to talk about the evolution of plants. My specialty in biology is animals, but I have always loved the story of plant evolution. Like all other major groups of life on Earth, plant life began in the water. Early plants were very reliant on water, but plants became less and less dependent on water as they evolved. In the water, life is easy. Dehydration is not a problem. Nutrients can be absorbed directly out of the water into the cells. The water will carry sperm for reproduction and disperse the offspring. Life in the water is good, but there was a lot of space to grow on land. 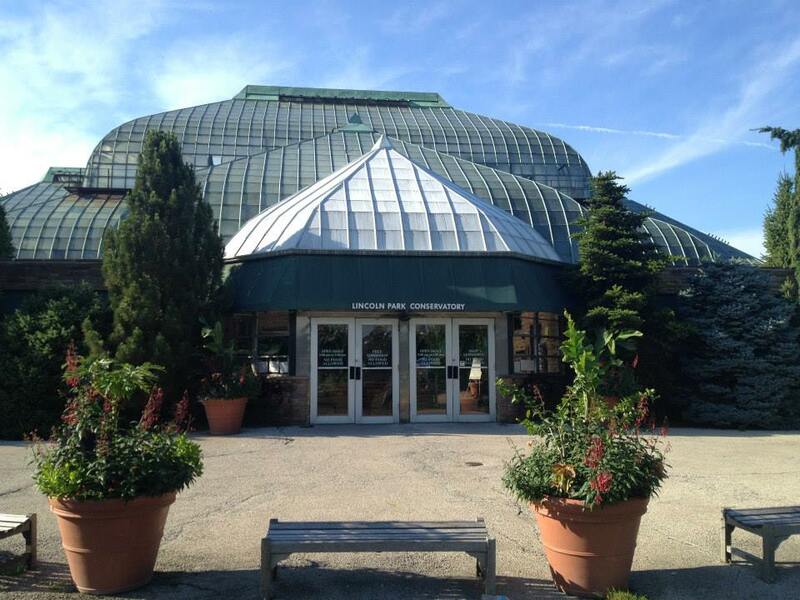 The Lincoln Park Conservatory is a great place to go. A cooler day is better. One of the first types of plants to live on land were the liverworts. They are very small, with leaves that lie almost flat on the ground. Liverworts have no ability to draw water up out of the ground, as later plants are able to do. As a result, they cannot grow very tall and must be damp all of the time. They cannot survive or reproduce without being wet. Liverworts are one of the first plants to live on land. 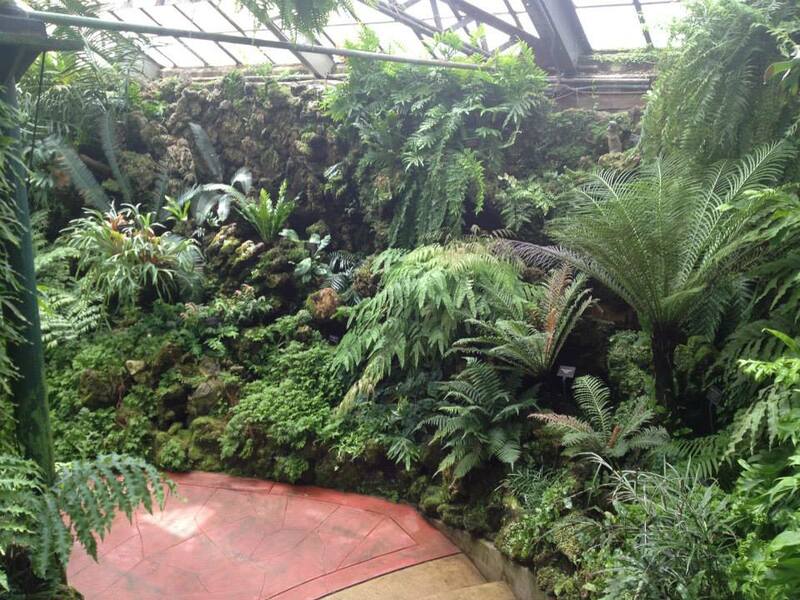 My favorite room contains the primitive plants: ferns, moss, liverworts, and cycads. 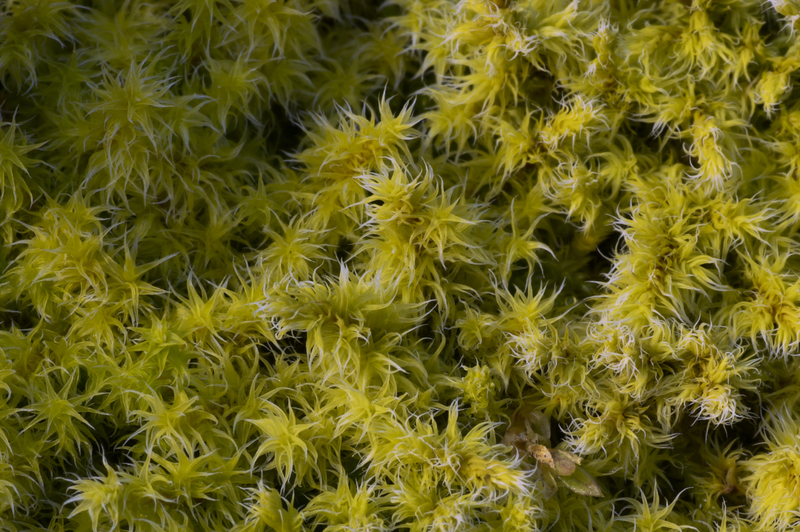 Like liverworts, moss also cannot draw water up into their bodies. Are able to grow a little bit taller than the liverworts because they grow in dense mats that can trap water between individual plants. This allows them to grow up to about four inches tall. Mosses do not dry out as easily as liverworts, but they do rely on water for reproduction. The male sperm must swim through the water to find a female plant. Like an idiot, I forgot to take a picture of moss. This one form wikipedia.org will have to do. 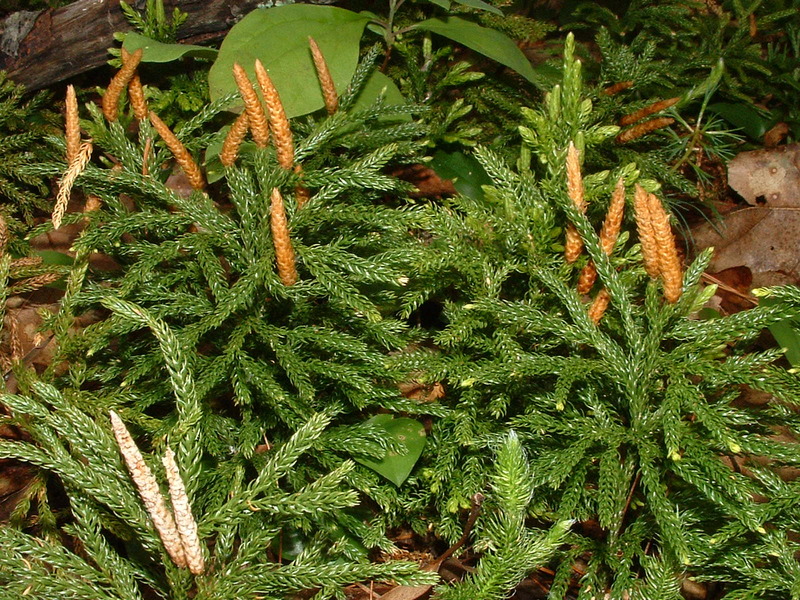 Club moss are sometimes called “ground pines” because they can resemble pine trees, but they are neither pines nor moss. Modern club moss usually only grow to be a few inches tall, but during the Carboniferous period, when they were the dominant land plant, they grew as tall as modern trees. Club moss are one of the first type of plants to have vascular tissue, which lets them draw water from the ground up into their bodies. This adaptation is of unparalleled importance for plants on land. For this reason, club moss were one of the first types of plants to be able to grow more than a couple of inches tall. Without vascular tissue, a plant more than an inch or two has no way of getting water to the upper part of the plant. Plants don’t need very much to live, but access to sufficient sunlight is one of their main requirements. When all of the plants around you are only two inches tall, a plant that can grow to be several feet tall or taller has an enormous advantage when it comes to getting sunlight. You can grow taller than your neighbors and spread out to get all the sun you want. Coal is made of fossilized plants from the carboniferous period. The majority of coal is made up of ferns and club moss. Sometimes coal preserves the structures of the plants it was made from and we can use the coal fossils to learn about ancient plants. Evolutionarily speaking, ferns are slightly newer than the club moss. Like the club moss, ferns are have vascular tissue (so does everything else from here on). Compared to most other plants, ferns grow sideways. The stem lies horizontally underground, and the fronds grow up out of the ground from it. When you see a cluster of fronds sticking up together, they are usually from the same plant. Structures on the underside of the fronds, called “sori,” contain spores. 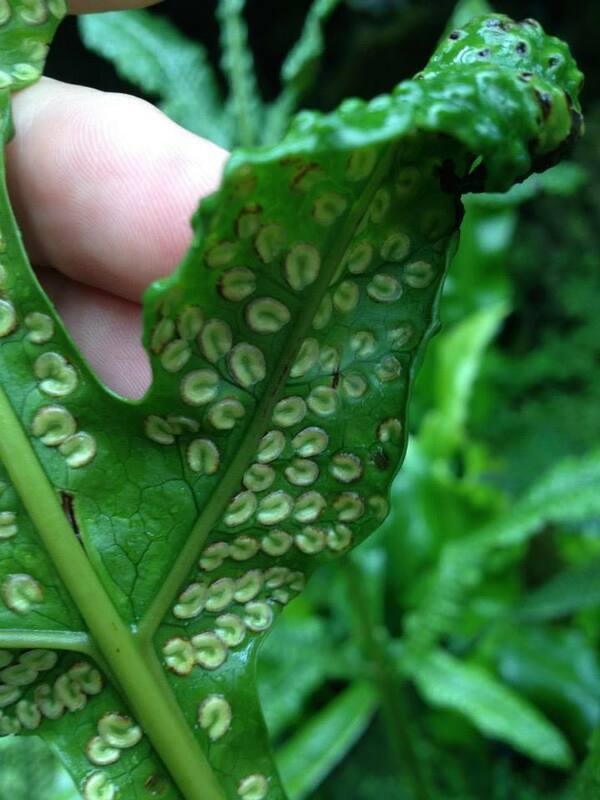 These capsules break open, releasing the spores, and new ferns grow where the spores land. 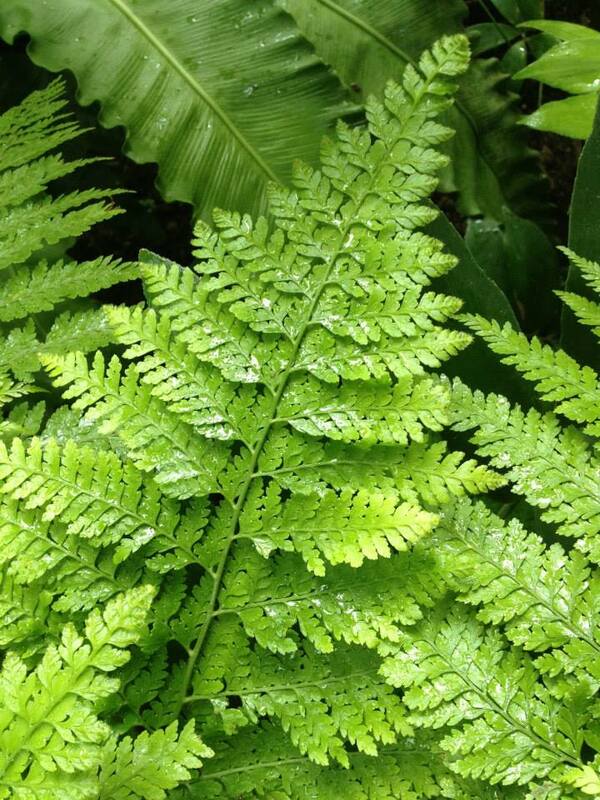 Sori are clearly visible on the underside of fern fronds. These contain spores. Cycads look superficially like palms, pineapples or yuccas, but is not closely related to any of them. They were one of the dominant types of plants during the mesozoic era — the age of the dinosaurs. Cycads were among the first plants to use pollen in reproduction. Pollen is produced by the male structures on plants, and is responsible for carrying sperm to the ovule in the female structures on other plants. Unlike the earlier plants, which require water for the sperm to swim through, pollen is carried by the wind. This is great for plants that live away from water and want to be able to reproduce with individuals that are far away. The problem is that it is fairly inefficient. Plants whose pollen is carried by the wind need to produce vast quantities of the stuff in order for some of it to get to other plants. I grew up in New Hampshire, where there a lot of white pine trees (which are not cycads, but also reproduce with wind-borne pollen). I got up many a morning to find my car completely covered in yellow pollen. All of that pollen that didn’t end up on the right part of the female plants is wasted energy. 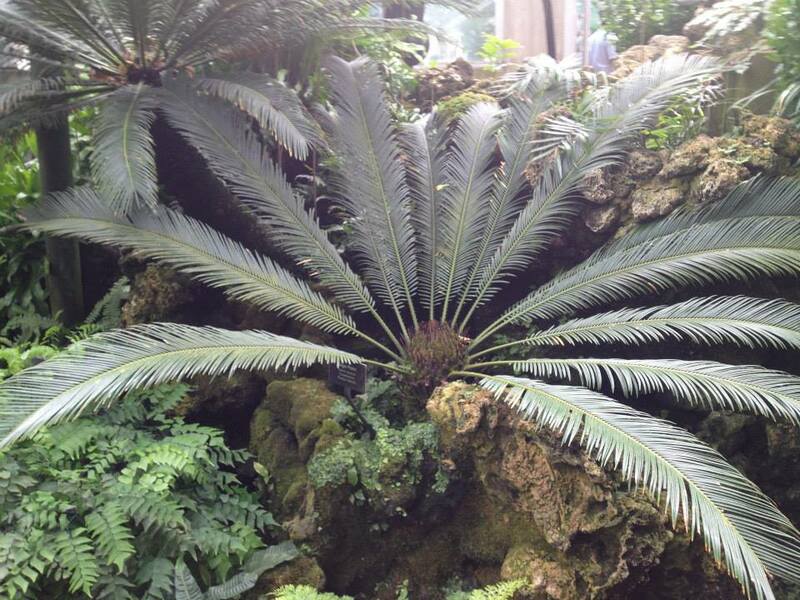 Cycads were also among the first plants to have seeds, instead of spores like the older plants. Spores are fine, but they cannot travel over long distances or lie dormant for a more opportune time to sprout. A seed contains the plant embryo as well as nutrients to keep it alive for months or years. If a spore happens to land on the back of a bird on its way to the other side of the country, the embryo inside may not survive the trip because its mother didn’t pack it lunch. An embryo inside a seed will survive the same journey because it is surrounded in an oil-rich substance called “endosperm.” When we eat nuts, it is the endosperm that we are after. Cycads can superficially resemble pineapples, yuccas or palms, but they are not part of the same group. 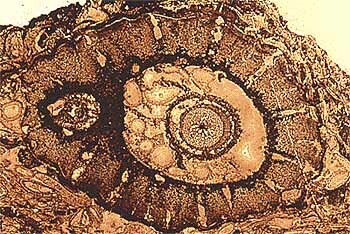 Flowering plants became the dominant plants of the world during the late mesozoic, and today account for the majority of plant species.There are over a quarter million living species of flowering plants, compared to only about 12,000 species of fern, and fewer than 10,000 species of liverwort. The flowering plants have two evolutionary advancements that allowed them to be so successful: flowers and fruit. These allow plants to solve two big problems in the area of reproduction. Flowers represent an exchange of goods and services between plants and animals. Big, colorful, aromatic flowers are nature’s equivalent of an “eat here” sign. Flowers produce sugar-rich nectar that animals like ants, butterflies, birds, and bats like to eat. While these “pollinators” are eating the nectar, they get covered in pollen. When they go to the next flower, they drop some pollen off and pick up some more. This results in animals carrying pollen directly from one plant to the next, with very little waste. Remember all that energy that earlier plants wasted trying to pollinate my car? 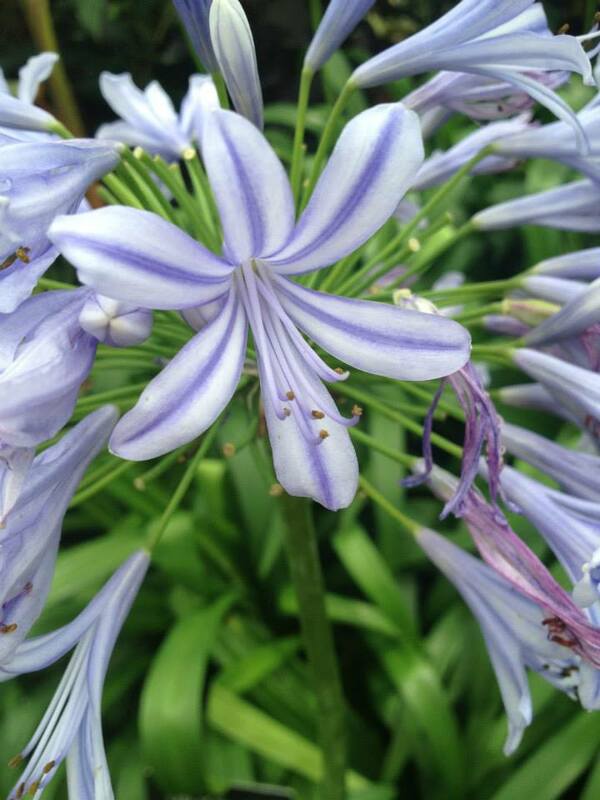 Flowers allow plants to use their energy more effectively. The energy this saves over relying on wind pollination is part of why flowering plants are so successful evolutionarily. Flowers attract certain animals, which carry pollen between flowers, helping the plants reproduce. Spreading seeds is another problem for plants. If seeds just fall off the parent plant and onto the ground, some will roll away or get kicked away. The others will sprout right next to their parent and compete for the same nutrients and light. This will reduce the success of both the parent and the offspring. Some (but not all) flowering plants produce fruit to solve this problem. Fruit is a sugar-rich substance that is easy to get eat, which surrounds the seed, which contains an oil-rich substance that is protected by a hard shell. In human terms, the plant “wants” you to eat the fruit, but does not “want” you to eat the seed. If you eat the seed, you are eating the tree’s offspring. If you (or another animal) eat the fruit, there is a good chance that you will swallow the seeds by accident. The hard shell protects it from being broken in your mouth or digested in your stomach. After eating the fruit, you (or whatever animal) will walk or fly away and eventually deposit the seeds far away in a nutrient-rich pile of fertilizer. Flowering plants are better at life on land than any other plants. They can draw water and nutrients out of the soil through their roots and vascular tissue, and they are very good at reproducing and spreading their offspring without the aid of water. This is why they are beating all of the other plants. 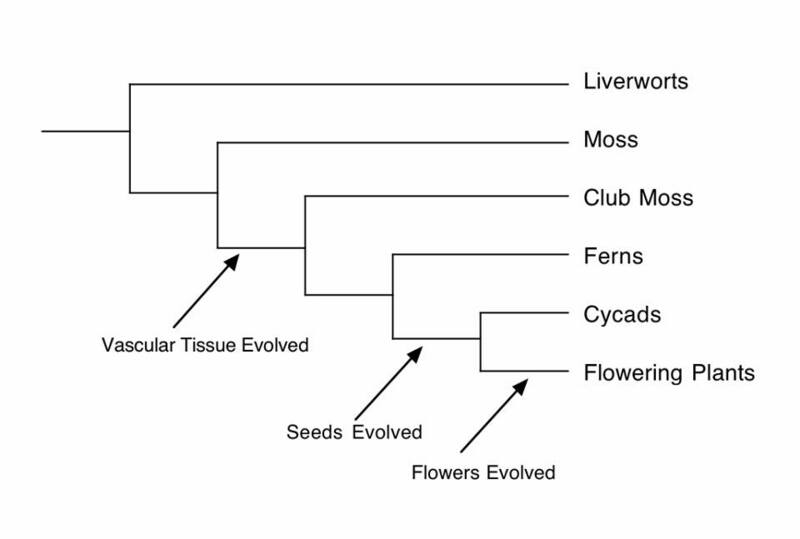 Cladogram showing the evolutionary relationships of the plant groups and major evolutionary advancements. Have a topic you want me to cover? Let me know in the comments or on twitter @CGEppig. Follow me on Facebook. Most of us are taught in school that plants make their food out of sunlight. While this is true in some sense, it is easy to miss what is really going on inside plants. Plants are sometimes depicted as receiving sustenance directly from the sun, just as we do from eating food, but this is not correct. I recently encountered a person who, upon hearing that plants make their food out of sunlight, believed that plants harness Einsteinian physics to convert energy into matter. This is not such a strange thing to believe, given the ubiquity of the “plants eat sunlight” meme. I want to set the record straight in this post. So what do plants eat? The short answer is that they eat glucose. Glucose is a simple sugar and it is the same thing a lot of other organisms eat for food. What’s different about plants (as well as some bacteria and protists) is that they make their own glucose. When animals want to eat glucose, they need to eat something that is already made of it. When we eat plants, a lot of the nutrition we are getting out of it is the glucose. Unlike animals, plants have the ability to build glucose out of other molecules — carbon dioxide and water. Once plants have built glucose, they can use it as a building material and they can us it as food. But what is food really? Food is energy stored in chemical bonds. When the chemical bonds are broken, the energy is released and can be used to power different body functions (a few more steps are involved, but this is the short version). Carbon dioxide and water are relatively low-energy molecules. Glucose has much more energy, and turning carbon dioxide and water into glucose requires the addition of energy. Plants harness the sun’s energy to make this happen. Glucose molecules are therefore vaguely analogous to batteries. Breaking down glucose into carbon dioxide and water is like releasing the battery’s charge, and combining them back into glucose is like recharging the battery. So do plants make their food out of sunlight? In one sense, glucose is made out of carbon dioxide and water, not sunlight. In another sense, the point of making glucose is to capture the energy from the sunlight. Water and carbon dioxide combining to form glucose is the vessel that carries that energy. What about carnivorous plants, like the pitcher plant, venus fly-trap and sundew? These plants have evolved to trap, kill and digest animals. 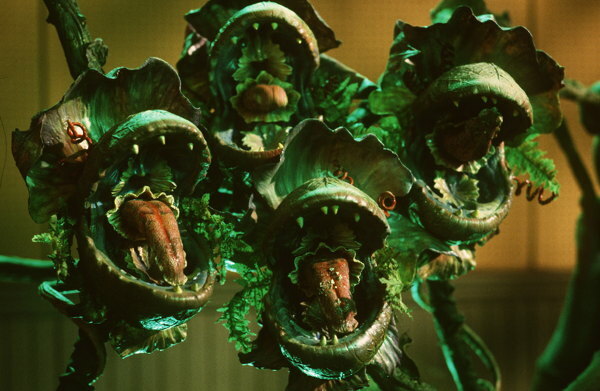 Carnivorous animals eat other animals for the protein and fat, but this is not the case for carnivorous plants. Plants need carbon dioxide and water to make glucose, and carnivorous plants are no different — but these are not the only molecules that plants need to thrive. Plants need to make proteins and other molecules that cannot be built using only carbon dioxide and water. These require nitrogen, phosphorous, potassium, calcium, and other molecules. 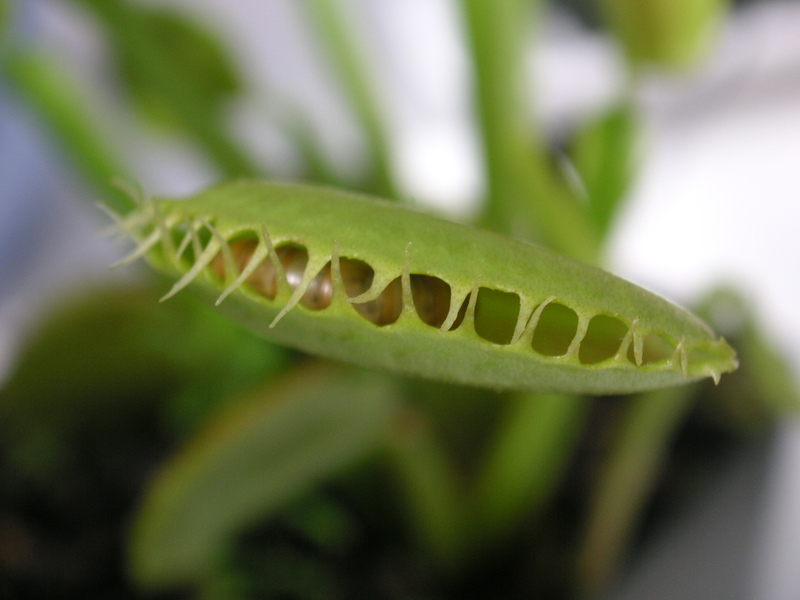 Carnivorous plants live in environments where these other nutrients are rare, and it is these nutrients that carnivorous plants are after when they eat animals. Have a topic you want me to cover? Let me know in the comments or on twitter @CGEppig.